The TI-RSLK Maze Edition curriculum comes with 20 learning modules covering basic to advanced topics. Each module is complete with lecture videos and slides, lab documentation and demonstration videos, quizzes and classroom activities. The TI-RSLK is targeted to teach embedded systems and applications and can be expanded and used in a variety of engineering classes. Learn more about the TI-RSLK Maze Edition curriculum's 20 learning modules covering basic to advanced topics. Download the free e-book with all lecture and lab videos in one document. The purpose of this module is to learn software development methodology and understand how to set up an Integrated Development Environment (IDE), to then import and export Code Composer Studio (CCS) projects, as well as critical debugging information to understand the memory usage and performance of the software on the processor. 04:28 You will learn how to set up Code Composer Studio and import the TI Robotics System Learning Kit, Maze Edition. Lab video accompanying Module 1 - Code Composer Studio Installation and Module 1 lecture and lab from the TI-RSLK curriculum. 02:14 Lab video accompanying Module 1 - Code Composer Studio Installation and Module 1 lecture and lab from the TI-RSLK curriculum. Additional lab video for Module 1 lab for TI-RSLK curriculum. 03:26 Additional lab video for Module 1 lab for TI-RSLK curriculum. The overall purpose of this lab is to introduce some of the development tools needed to design your robot. 03:13 The overall purpose of this lab is to introduce some of the development tools needed to design your robot. The purpose of this course is to review basic electronic components and the electrical properties needed to interface sensors and actuators to a microcontroller. You will learn how to measure reactance of a capacitor and use your project to measure current and voltage. The electrical properties of the capacitor will help you design circuits that “filter” or remove noise from your robot. Module 2: Voltage Current and Power will cover resistors, capacitors and LEDs. 26:17 Module 2: Voltage Current and Power will cover resistors, capacitors and LEDs. The purpose of this lab is to review basic electronics needed to interface sensors and actuators to the microcontroller. 03:30 The purpose of this lab is to review basic electronics needed to interface sensors and actuators to the microcontroller. In this particular portion of the lab, you will measure voltage and current across the LED. 02:42 In this particular portion of the lab, you will measure voltage and current across the LED. Understanding how the processor works is essential for the design of embedded systems, such as the one used in your robot. 20:09 Understanding how the processor works is essential for the design of embedded systems, such as the one used in your robot. In this module you will develop and test an assembly function the maze robot might use to perform a numerical calculation. 23:01 In this module you will develop and test an assembly function the maze robot might use to perform a numerical calculation. The purpose of this lab is to introduce the architecture of the Cortex M.
03:09 The purpose of this lab is to introduce the architecture of the Cortex M.
This module is an introduction to C, a general-purpose programming language, in addition to the concepts of compiling and debugging using the MSP432 and TI Code Composer Studio™. Debugging skills are a valuable tool when developing complex systems involved with robotics. Learn software design through a call graph, data flow graph, successive refinement, abstraction (functions) and modular design (header/code files). 19:51 Learn software design through a call graph, data flow graph, successive refinement, abstraction (functions) and modular design (header/code files). 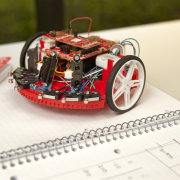 In this module, you will develop and test software functions that will be used in the maze robot. 26:31 In this module, you will develop and test software functions that will be used in the maze robot. Learn debugging on the MSP432 through controls (step, breakpoints), observing variables and functional debugging. 17:27 Learn debugging on the MSP432 through controls (step, breakpoints), observing variables and functional debugging. The purpose of this lab is to interface a line sensor that the robot will use to explore its world. 03:57 The purpose of this lab is to interface a line sensor that the robot will use to explore its world. The purpose of this lab is to introduce software design. 04:08 The purpose of this lab is to introduce software design. The purpose of this module is to learn how to power your robot. To run the robot (motor and other systems) you will need batteries and a regulator to provide constant voltage. Understanding the relationship between voltage current and power is an essential component of robot system design. Learn battery power sources, voltage regulation (constant voltage) and performance measurements. 21:32 Learn battery power sources, voltage regulation (constant voltage) and performance measurements. The purpose of this lab is to study the batteries and how they are used to power the robot. 02:04 The purpose of this lab is to study the batteries and how they are used to power the robot. The purpose of this lab is to power the system from the batteries. 03:54 The purpose of this lab is to power the system from the batteries. In this module, you will interface a line sensor (infra-red sensor) to the microcontroller and learn how to write software to initialize GPIO pins. The line sensor is a simple and accurate sensor for solving robotic challenges. In this module you will design, develop and test the line sensor measurement required for the maze robot. 22:13 In this module you will design, develop and test the line sensor measurement required for the maze robot. 23:29 In this module you will design, develop and test the line sensor measurement required for the maze robot. The purpose of this lab is to interface the reflectance sensor to the robot. 03:02 The purpose of this lab is to interface the reflectance sensor to the robot. In this particular portion of the lab, we're going to test the high-level performance of the line sensor. 02:45 In this particular portion of the lab, we're going to test the high-level performance of the line sensor. 20:43 In this module you will use a finite state machine to create a controller for a simple line following robot. 25:38 In this module, you will learn how to use finite state machines as a central controller for a robotics system. 02:35 The purpose of this lab is to learn how to design a microcontroller-based finite state machine. 02:52 The purpose of this lab is to develop a line-following algorithm using a finite state machine. The purpose of this module is to develop interface switches and an LED so the robot can effectively detect wall collisions. Many sensors and actuators deploy LEDs, so understanding how they operate will be important to building your robot. 18:57 In this module you will learn the fundamentals of LEDs and switches. 02:37 The purpose of this lab is to interface three switches and a LED to the micrcontroller. In this module, you will learn the fundamentals of SysTick timers and pulse width modulators (PWM), including how to measure pulse times and period with a logic analyzer and amplitude with an oscilloscope. It is important to understand the concept of PWM as we will use it to adjust power to the motors. 12:55 In this module you will learn SysTick timer fundamentals. 11:35 You will learn the concept of Pulse Width Modulation (PWM) and duty cycle. The purpose of this lab is to learn about the SysTick timer and use it to create a PWM output. 02:15 The purpose of this lab is to learn about the SysTick timer and use it to create a PWM output. 03:27 The purpose of this lab is to create a PWM output. This module provides an intro to how flash memory operates, including debugging techniques for real-time systems and how to generate periodic interrupts using SysTick. Minimally intrusive debugging is essential for real-time systems to evaluate performance while the system runs in real-life situations. In this lab you will learn how to generate periodic interrupts using SysTick. 20:24 In this lab you will learn how to generate periodic interrupts using SysTick. 20:37 In this lab you will learn how to generate periodic interrupts using SysTick. The purpose of this lab is to provide real-time debugging and use SysTick interrupts to interface the line sensor. 03:17 The purpose of this lab is to provide real-time debugging and use SysTick interrupts to interface the line sensor. This module will show you how to display characters and provide real-time debugging on an LCD screen. An LCD on your robot provides a convenient way to observe what it is thinking. In this module you will learn how to interface a LCD to TI's LaunchPad development kit. 11:07 In this module you will learn how to interface a LCD to TI's LaunchPad development kit. Review Software/hardware synchronization with busy-wait and understand synchronous serial communication. 02:07 Review Software/hardware synchronization with busy-wait and understand synchronous serial communication. The purpose of this lab is to interface the motors to the TI LaunchPad to make the robot move. Understanding how duty cycle, voltage and current combine to affect speed is required when building your robot. In this module you will receive an overview of the circuits needed to drive power to the DC motors. 14:43 In this module you will receive an overview of the circuits needed to drive power to the DC motors. The focus of this module is the mechanical and electrical aspects of the motors. 20:17 The focus of this module is the mechanical and electrical aspects of the motors. The purpose of this lab is to interface the motors to the LaunchPad. 02:39 The purpose of this lab is to interface the motors to the LaunchPad. The goal of this lab is to see how straight the robot moves if we were to set the two duty cycles to an equal value. 01:46 The goal of this lab is to see how straight the robot moves if we were to set the two duty cycles to an equal value. In this module you will learn how to interface the DC motors using hardware PWM. 14:28 In this module you will learn how to interface the DC motors using hardware PWM. 18:37 In this module you will learn how to interface the DC motors using hardware PWM. Understand timers and their uses in embedded systems and interface the DC motors using hardware PWM. 01:58 Understand timers and their uses in embedded systems and interface the DC motors using hardware PWM. Understand timers and their uses in embedded systems. 02:36 Understand timers and their uses in embedded systems. This module demonstrates how to use priority interrupts for creating real-time systems. As your robot system becomes more complex, period interrupts are one way to combine multiple threads onto one microcontroller. Review interrupts and the Nested Vector Interrupt controller (NVIC) and understand how to use priority interrupts for creating real-time systems. 01:34 Review interrupts and the Nested Vector Interrupt controller (NVIC) and understand how to use priority interrupts for creating real-time systems. This module will teach you how to interface the infrared distance sensors using the analog-to-digital converter. IR distance sensors are an essential component for solving robot challenges where avoiding walls is necessary to achieve the goal. In this module you will learn how to create a real-time data acquisition system that measures distance from three IR sensors. 20:42 In this module you will learn how to create a real-time data acquisition system that measures distance from three IR sensors. 22:40 In this module you will learn how to create a real-time data acquisition system that measures distance from three IR sensors. In this module, you will learn how to interface the tachometers that enable the robot to measure motor rotational speed. Tachometer data allows your software to drive straight, drive for a prescribed amount of distance or turn at a prescribed angle. In this module you will learn how to design a system that can measure wheel rotational speed. 15:01 In this module you will learn how to design a system that can measure wheel rotational speed. 11:46 In this module you will learn how to design a system that can measure wheel rotational speed. The purpose of this module is to create a control system by combining the sensors with the actuators. Incremental and integral control are simple algorithms for controlling motor speed. In this module you will learn the basic concepts of a control system. 22:24 In this module you will learn the basic concepts of a control system. You will learn an introduction to control. 02:26 You will learn an introduction to control. Inputs, control equations and outputs. 02:40 Inputs, control equations and outputs. The purpose of this module is to understand the operation and use of first in first out (FIFO) queue to interface the robot to the PC using a serial channel. You will create two FIFO queues and design a command interpreter to assist in the robot challenge. You will develop an interrupting device driver using the universal asynchronous receiver/transmitter (UART). This serial port allows the microcontroller to communicate with devices such as other computers, input sensors, and output displays. Learn FIFO queues, buffered I/O and Little's Theorem. Perform measures of bandwidth and response time. 08:42 Learn FIFO queues, buffered I/O and Little's Theorem. Perform measures of bandwidth and response time. You will develop an interrupting device driver using the universal asynchronous receiver/transmitter (UART). 12:33 You will develop an interrupting device driver using the universal asynchronous receiver/transmitter (UART). The purpose of this lab is to create an interrupt-driven UART driver. 04:52 The purpose of this lab is to create an interrupt-driven UART driver. 02:39 A command interpreter allows you to test multiple parts of your complex system. The purpose of this module is to understand basic concepts of Bluetooth® low energy (BLE). You will interface the TI SimpleLink™ BLE CC2650 Module BoosterPack™ Plug-in module to the SimpleLink MSP432P401R LaunchPad™ development kit using universal asynchronous receiver/transmitter (UART) communication. You will create a BLE service with multiple characteristics and design a robot system that can be controlled by a smart device using BLE. The purpose of this lab is to create an interrupt-driven UART. 12:45 The purpose of this lab is to create an interrupt-driven UART. The purpose of this module is to understand basic concepts of Bluetooth® low energy (BLE). 11:09 The purpose of this module is to understand basic concepts of Bluetooth® low energy (BLE). Interface the TI SimpleLink™ BLE CC2650 Module BoosterPack™ Plug-in module to the SimpleLink MSP432P401R LaunchPad™ development kit UART. 10:25 Interface the TI SimpleLink™ BLE CC2650 Module BoosterPack™ Plug-in module to the SimpleLink MSP432P401R LaunchPad™ development kit UART. The purpose of this lab is to develop a robot system that can be controlled by a smart device. 04:02 The purpose of this lab is to develop a robot system that can be controlled by a smart device. Design a robot system that can be controlled by a smart device using BLE. 03:00 Design a robot system that can be controlled by a smart device using BLE.